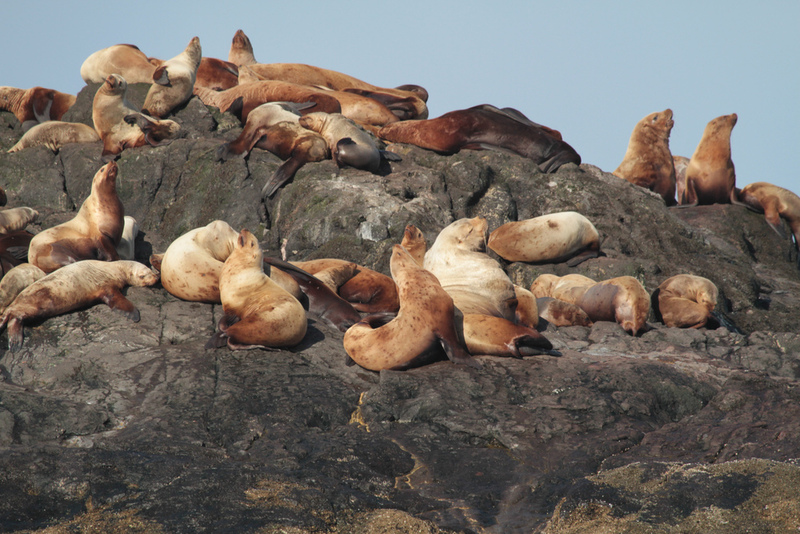 This trip is great for those who want to see the UNESCO site of SGang Gwaay (Ninstints) and the exposed shorelines of the southern end of Gwaii Haanas, but also take the time to relax in the more sheltered waters around Burnaby Island and Hotsprings Island. Day 1: Moresby Explorers will pick you up from your accommodations in Sandspit at about 7:30 a.m. You will load your gear into a van and drive for about 1 hour down the logging roads to Moresby Camp. Here you load gear and kayaks into one of our open Zodiacs and head into Gwaii Haanas. After about 2 hours in the boat we reach the Juan Perez Sound area, the start of your kayak expedition. After unloading from the Zodiac you are on your own for the rest of the trip. Day 2-9 (or 2-10): When you are dropped off by the Zodiac, you can choose to get dropped off near Hotsprings Island, or near Marco Island on the other side of Juan Perez Sound so that you do not have to make the exposed crossing over Juan Perez Sound. Keep in mind that the hot pools at Hotsprings Island dried up due to an earthquake in 2012, but there are still some “footbaths” of hot water, and Haida Watchmen are stationed here as well, making it a very interesting site to visit. If you start here, you may need to wait for good weather or backtrack a little to get across Juan Perez Sound. You will make your way down to Burnaby Narrows, where at low tide you can see the beautiful intertidal life that this area is famous for. As you make your way south out of the mouth of Skincuttle Inlet, you will quickly get into some more exposed shorelines, and will have to keep a close eye on the weather each day. There are several sheltered bays and inlets in this area where you can wait out a storm if necessary. After making your way through Huston Stewart Channel, you will come out onto the west coast of Moresby Island, where you can experience the exposed shorelines of the open Pacific. Day 10 (or 11): Before heading out on your trip, you should check with our office about expected pick-up times and where you plan to be on your pick-up day. In general, you should have most of your gear packed up and organized by mid-day (leave a tarp or tent for shelter if it is raining). Wait for the Zodiac on the beach you agreed on before departure, or if you are unsure, go to the big beach at Raspberry Cove across from Rose Harbour. As weather, tides, wild life sightings etc. all have an impact on our speed we cannot give you a precise ETA, but we usually arrive early to late afternoon. When we arrive we will unload our outgoing guests, load your group and head back to Moresby Camp, about 4 hours on the Zodiac. On arrival at Moresby Camp we will trailer the boat, load the gear into the van, head back to Sandspit and drop you off at your accommodations. Transportation for this trip: For this itinerary, you will need boat transportation to Juan Perez Sound and from Rose Harbour (or vice versa). Prices and availability can be found on our Transportation schedule. To calculate the total price, be sure to note that each price is per person, one-way. Marine Charts: For this trip you will need chart number 3853 and/or all of 3808, 3809 and 3825. Marine charts are available from most marine stores and online.